Stock status is current as of 4/26/2019 3:56 AMET. The Aluratek Volume-Limiting Wired Foam Headphones are designed for children to provide them with a comfortable and safe way to enjoy music and games. They use a standard 3.5 mm audio jack, so they're compatible with a wide variety of devices from smartphones to gaming devices. 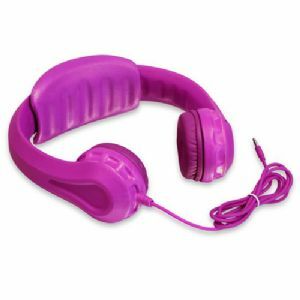 To protect children's ears, the headphones can only reach a max volume of 85 dB. Furthermore, they are constructed out of a single piece of EVA foam, which is non-toxic and BPA free, making the headphones lightweight, durable, and flexible. Leather earpads provide comfort for hours of use, and an included headband pad can be attached to provide a snug fit for smaller children. Buy Aluratek Volume-Limiting Wired Foam Headphones now! Fits most children's heads ages 3 and up. Aluratek logos are registered trademarks of Aluratek. All others trademarks and copyrights mentioned herein are the property of their respective owners.